We have been privileged to collaborate & combine talents with many fine craftsmen in Kauai, Laguna Beach, Arizona & Colorado. 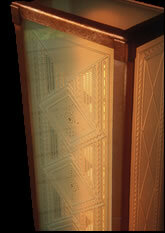 This old world style copper sconce is one of our finest examples of hand hammered and forged copper. Carved glass copper insert, Kauai HI.